This online version of the Family of Gibbs is the culmination of four hardback editions of the ‘Pedigree of the Family of Gibbs’, the original being written by Henry Hucks Gibbs in 1890. The fourth, and most recent hardback edition of the Gibbs Pedigree was edited and produced by Rachel Gibbs in 1981. This website brings the Family of Gibbs pedigree into the online world of the 21st century. The family tree dates back to the mid 16th century, when the house ‘Pytte’ was bought. Diligent research in Devonshire archives will, in due time, probably unravel the story and take us back to the 14th century. The Gibbs Family Tree is the primary point of free access for members of the Gibbs family and visitors, to search their relatives, find out more about the Gibbs family, and keep Gibbs family tree records accessible and up-to-date. The history and heritage of the Gibbs Family has been carefully researched and documented over the centuries. A family of adventurers, merchant traders, bankers, lawyers, war heroes and heroines, land owners, founders of institutions, Members of Parliament, three hereditary peers and several knights, Directors and Governors, gentlemen and clergymen, doctors, city men and countrymen, and staunch supporters of Church and State. 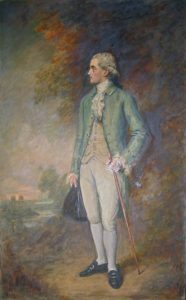 It was Antony Gibbs (pictured here) in the 1800s who, under the watch of his sons, William and Henry, laid the foundations of the Gibbs dynasty with the profits of the guano trade from South America. And visit Tyntesfield, home to William Gibbs in the 19th Century, now owned and run by the National Trust. Go directly to the Family Tree home page to access records and search family members. The tradition of the hardback Gibbs Pedigree editions included only those who are Gibbses and their spouses, or whose mother was a Gibbs. However we have extended this online version to include further descendants of the female line. And please do contact me, Mike Gibbs, if you have a query about the site, the Gibbs family, or if you are a family member and would like an update to be made.